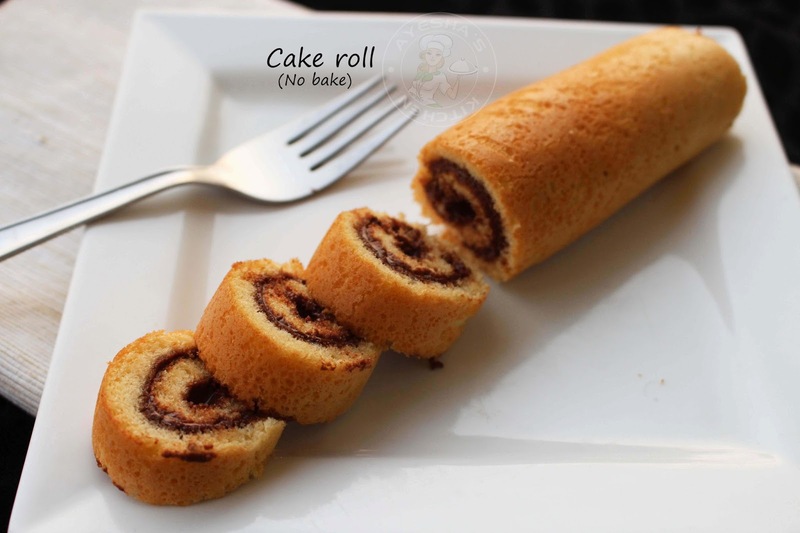 Hi guys, here am with a pretty easy, moist and fluffy cake roll recipe. That too made in a frying pan on stove top without an oven. So don't worry if you do not have a swiss roll tin / swiss roll pan. This recipe will gives you a perfect fluffy cake roll. There are no such common problems like : the crust cracks while rolling, the cake is not soft and fluffy, the crust is sticking to the cling film and all. This is a perfect swiss roll recipe for a medium sized swiss roll / cake roll. Friends, i have a request that please be careful while doubling the ingredients. Swiss roll / roll cake is loved by all age groups equally. Me too are a big fan of less sweet creamy chocolate swiss rolls and i often go for a store bought only. I have been buying these chocolate roll cakes from grocery as i am worried of above said problems. But now i started making this lovely yummy treat at home as i knew that they are just as convenient. Since there are no scary ingredients in homemade recipes, you can eat more without any worries. Kids will love this with no doubt. Moreover, all those ingredients are ready in your pantry except the cake flour. But here is a great substitution for the cake cake flour too. Just two ingredients are needed for a perfect cake flour (recipe is given below with pics). 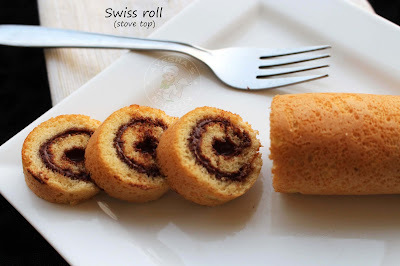 Many of us, think that it is very hard to make swiss rolls at home. But its time to change that mind. Making a fluffy swiss rolls in a frying pan are quite easier than that of making a soft moist cake. 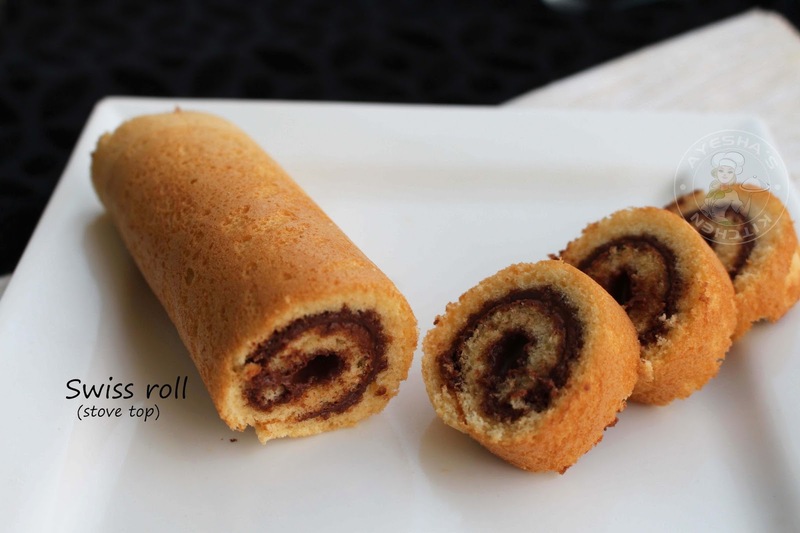 You can make chocolate swiss roll recipe in a frying pan (stove top) following the same recipe. Hope i can share the same soon. So here is the recipe showing how to make swiss roll in a frying pan / swiss roll recipe / easy Christmas desserts or treats/ easy Christmas cake recipes/ cake roll / roll cake/ yummy dessert / kids dessert ideas / jelly roll cake recipes. Enjoy! Add the egg and sugar in a bowl. Beat it well with an electric mixer until white and fluffy. Add two tablespoons of sifted cake flour (recipe given below) to it. Fold it gently until well combined. Do not add more cake flour than required. To this, add oil and vanilla essence (to get rid of egg flavor). Mix well with a spoon. Heat a nonstick frying pan (a medium sized) and make the flame medium low. Grease the pan well with oil. Pour in the prepared batter, cover with an aluminium foil and then cook on a low flame for 5 -6 minutes or until the top becomes dry. Do not cook for long. Transfer it to a cling film. Wrap it and then gently roll it. Let it cool completely. Keep refrigerated for 15 minutes. When done, take it out, remove the cling film and cut off the ends diagonally. Spread nutella / hazelnut spread over it. Then roll up the cake tightly with care. Wrap in a cling film and cool them in the fridge to set. Cut both the ends, slice and serve. For a best slice, let it cool for 1 hour or more. So that you can cut them perfectly. As i couldn't wait for long, i sliced them off after 15 minutes. Take one leveled cup (250 ml) of All purpose flour. From this, remove two tablespoons of all purpose flour. And then add two tablespoons of cornflour / cornstarch back in instead of the removed All purpose flour. So we get one cup of CAKE FLOUR. Cornstarch / cornflour will inhibit the formation of gluten when added to all purpose flour. This gives the structure and sponginess to your cake.